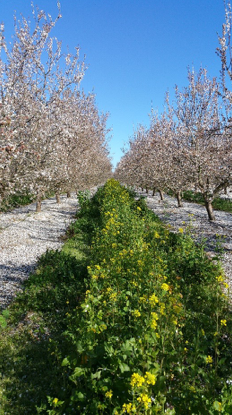 Cover Crop Competition - Project Apis m.
Are you concerned about a blooming cover crop competing with your almond bloom? Almonds provide bees with large quantities of high protein pollen in a relatively small area, which is attractive to bees. The anthers on the almond flower are easily accessible, making it very attractive and easy for honey bees to collect. Bees are opportunists; they want to work almonds! In contrast, the flowers in the Seeds for Bees cover crop mixes have anthers that are harder to access, making them less appealing. In 2017, UC Davis researchers concluded: “Alternative flowering resources can be added to almond orchards, even during bloom, without jeopardizing crop pollination” . Bees generally have worked all the pollen from almond trees by mid-afternoon—targeting almond pollen before moving on to other pollen sources. There is no reason to be concerned about cover crops competing with almond bloom! They will only make the bees stronger. Having other pollen sources available, like early blooming mustards, promotes a pollen-collecting cycle. The pheromone of brood triggers pollen foraging. Pollen collection stimulates the queen to lay eggs (brood), which motivates the bees to collect even more pollen to feed their young. As the population increases, the field-worker force also increases. If abundant, foraging bees may collect nectar and pollen in greater amounts than are needed to maintain brood rearing. When reared in pollen-limited hives, bees communicate less efficiently, thus potentially harming yield  . Cover crops also help the almond orchard by increasing organic matter, nitrogen, and soil fertility and preventing erosion . Anchor your bees to your orchard by providing an attractive, alternate source of food. If your neighbor’s orchard has a cover crop and you don’t, the bees you paid for will spend time at the neighbors. DeGrandi-Hoffman G., Chen Y., Rivera, R. et al. Apidologie (2016) 47: 186. Heather R. Mattila, Gard W. Otis. The effects of pollen availability during larval development on the behaviour and physiology of spring-reared honey bee workers. Apidologie, Springer Verlag, 2006, 37 (5), pp.533-546. Lundin, O., Ward, K.L., Artz, D.R., Boyle, N.K., Pitts Singer, T., Williams, N.M. 2017. Wildflower plantings do not compete with neighboring almond orchards for pollinator visits. Environmental Entomology. doi:10.1093/ee/nvx052.